Take an action now and fill in this short form in English today. DDLN: 5th of May 2019. Apply for a mentoring programme in Košice for future leaders of communities and bottom-up initiatives, led by CIKE and international experts. Note: This article is written in English because your written and spoken command of English is necessary for the Community Bootcamp. Curious soul: You want to share know-how, gain new insights and network with like-minded people. Now you have a unique opportunity to sign up for an educational mentoring programme which will help you decide which direction to move forward to. This autumn, you will have the chance to participate in Community Bootcamp in Košice: 5 day-long workshops full of custom-made education and vocational training. You will network and receive mentorship from international experts with successful experience in areas such as leading co-working centres/communities and crowdfunding finance. Apply until the 5th of May through this short form. Entrance fee for the chosen participants is €50. Lecturers of the Community Bootcamp will provide you with valuable information, concrete examples from practice and useful tools for working with communities, clubs and groups. More precisely, how to build, co-create or manage them, how to maintain them, how to communicate appropriately internally and externally and how to get the finances for your dream activities. A very important part of the programme is mentoring throughout which you will have the space to go over your personal goals and plans. Moreover, after the Bootcamp is finished, mentors will help you evaluate your growth, activities and decisions. The desired participants of the Bootcamp are leaders or participants of communities. Design, IT, coworking, gaming, media arts, dance, education, business, music, illustrations, marketing, startups - applications are welcome from all kinds of different areas of interests and the applicants do not have to be based only in Slovakia. Since Community Bootcamp is taught in English, your written and spoken command of English is a prerequisite. Important: Think through properly how much time you are willing and able to invest in your growth. Community Bootcamp will take place over the course of one entire work week and it is essential that you participate during each of these 5 days. Spring: Your application will be reviewed by CIKE and the mentors and we will choose 10 participants. During the decision making, we will consider your motivation and the potential impact of your activities on the city/country. You will be in contact with the mentors and CIKE to define your needs together. After further talks, apart from the themes for educational activities, you will also set individual goals. Summer: Lectors will create custom Bootcamp for the participants. Autumn, 11-15th of November: Bootcamp full of theory, practice, hands-on learning and mentoring begins! Tânia Santos (Portugal) is an expert in creative hubs and community building. Tânia is the founder and manager of CRU Cowork - a creative hub that combines coworking space, art gallery and a designers' store in Porto. She is also the coordinator of the most important street market in Porto, where she weekly presents a hand-picked selection of music, paper and bioproducts from local businesses. 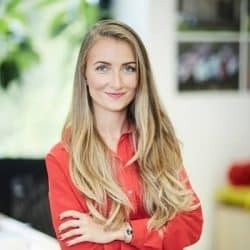 Having studied psychology, economics and innovation management, Tânia’s main interests and work focus is on Entrepreneurship and Creative Business Development, Human Centered Design, Collaborative Work and Creative Economy. Since 2018, Tânia is an interim steering committee member of the European Creative Hubs Network and also became a consultant in the European Development Institute. Luka Piškorič (Slovenia) is a cultural and creative industries specialist. Luka has been working as a producer and consultant in cultural and creative industries for over 20 years. He co-founded Slovenia Coworking and Slovenia Crowdfunding initiatives to build creative communities and help creators fund their projects. His activities have naturally led to the foundation of Poligion Creative Center - an autonomous collaborative space and a platform for independent professionals, creative communities and start-ups in the creative economy, social entrepreneurship and culture. He is also one of the founding members of the Cultural Policy Designers Network. He lectures on numerous conferences around Europe, provides consultations and facilitates workshops addressing the topics such as co-working, crowdfunding community building and audience development. This is your chance to start or grow a project that keeps your mind busy. Take an action now: fill in this short form in English today. Community Bootcamp is supported by public funding from the Slovak Arts Council.